The Antarctic Ocean, also known as the Southern Ocean, the Great Southern Ocean, or the South Polar Ocean, is a large body of water encircling the continent of Antarctica. This ocean is considered by the International Hydrographic Organization to be the fourth largest body of water of any of the world's principal oceans. It has only recently been defined by the scientific community, although the term Antarctic Ocean was used in earlier times by sailors and those involved with marine research. The term the Antarctic Ocean is contested by marine scientists, who debate the exact borders of the ocean and the properties that constitute an ocean as a body of water. There are many scientists who believe that the Antarctic Ocean should not exist as a labeled body of water and instead classify the waters in that Antarctic region as part of the Pacific and Atlantic Oceans. The Antarctic Ocean lies in the farthest edge of the Southern Hemisphere, and is consequently severely impacted by the sun's seasonal influence. In particular, during the colder months, when the sun is not shining directly on the ocean, the ice packs melt to an average low of 2.6 million square kilometers. When the sun moves away from the ocean, the ice packs rebuild. The ocean as a whole is distinguished by a narrow and deep continental shelf, and average depths between 4,000 and 5,000 meters. The Antarctic Ocean is considered by many oceanographers to be the youngest of the world's oceans, formed only 30 million years ago. The ocean formed as a result of tectonic movement, specifically when Antarctica and South America moved apart during the early stages of the earth's development. When the two plates moved apart they opened up the Drake Passage, allowing the Antarctic Circumpolar Current to begin to form. This water current is a distinctive feature of the Antarctic Ocean, as it helps to keep the waters flowing around the continent of Antarctica. All waters that are stuck in the Antarctic Circumpolar Current flow eastward quickly, as the current is estimated to move 130 million cubic meters of water per second. 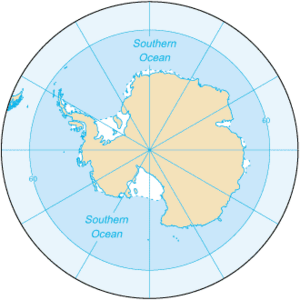 The Antarctic Circumpolar Current plays an important role in the controversy regarding the naming of the Antarctic Ocean as its own aquatic body. For those scientists who believe that the Antarctic Ocean deserves its title, the current separates the waters of the Antarctic Ocean from the waters in the Atlantic or Pacific Oceans. In essence, only the rapidly circulating water is considered the Antarctic Ocean. A few remaining scientists, on the other hand, believe that the current complicates the naming issue, by not limiting the waters to a specific geographic area so much as a weather current. The waters in the current are compositionally different from waters in the northern oceans, however, by being far colder and having higher salt levels than other waters. The Antarctic Ocean frequently experiences cyclone-like storms that result from the stark contrast between the ice packs and the ocean waves. These storms are very harsh for any sailors or marine vessels that happen to be caught in their path: they have the strongest winds found anywhere on earth. In addition to the storms, marine vessels must be careful of frequent icebergs and low surface temperatures. The icebergs in the Antarctic Ocean pose a threat to vessels all year long, some of which span for several hundred meters. Marine vessels and sailors in the Antarctic Ocean are particularly wary of the high winds and large waves that result from the cyclones in the oceans. Earning the nicknames of "Furious Fifties" and the "Shrieking Sixties" the latitudes from 50-70 are particularly feared because of their year round peril to sea faring vessels. The vessels that do brave the harsh conditions of the Antarctic Ocean do so in search of profits from the large amounts of natural resources in the area. The Antarctic Ocean is commonly used as a source of access for the petroleum and natural gas fields on the continental margin, as well as a route of access to sand and gravel. As an ocean, the waters also provide squid, whale, sea mammals, krill, and a variety of fish for world markets. The history of the Antarctic Ocean is intrinsically tied to the debate regarding its labeling as an independent ocean. The Antarctic Ocean was originally referred to as the Southern Ocean, and the name still persists in the scientific community. The Antarctic Ocean, or Southern Ocean, first made an appearance in the Second (1937) Edition of the IHO's Limits of Oceans and Seas. In the Third Edition, published in 1953, the term Antarctic Ocean was missing, as the IHO felt that it was incorrect to define the Antarctic Ocean as its own distinct ocean. At this time in history it was felt that an ocean should be defined as "water surrounded by land" not "water encircling land." The question of the Antarctic Ocean was reconsidered in 2000. By a majority vote of the panel, the term Southern Ocean was selected, over the commonly used Antarctic Ocean. The majority also decided that the ocean should be defined as ending at 60° line of latitude. Some of the votes in the minority voted for the line of delineation as far as 35° south latitude. The Antarctic Ocean faces many distinct ecological threats to its natural marine ecosystems. The first threat to the delicate balance of the underwater climate is the constant ultra violet radiation that streams into the ocean from the Antarctic ozone hole. 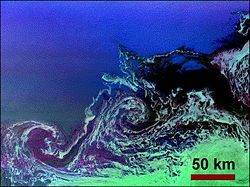 As the ozone hole continues to expand, the levels of ultraviolet radiation increases in the ocean, decreasing the productivity of the phytoplankton. Another important threat to the marine ecosystem is unregulated overfishing. Due to the current lack of regulation, fishing in the region is severely limiting the sustainability of the marine fish stock. Many nations prohibit mineral resource exploration and exploitation south of the fluctuating Polar Front, which is in the middle of the Antarctic Circumpolar Current and serves as the dividing line between the very cold polar surface waters to the south and the warmer waters to the north. Since the Antarctic Treaty covers the portion of the globe south of sixty degrees south, claims to Antarctica and all islands in the Antarctic Ocean are suspended. Fisheries are responsible for producing the largest amount of exports from the Antarctic Ocean, producing over 119,898 tons between 1998-1999 alone. 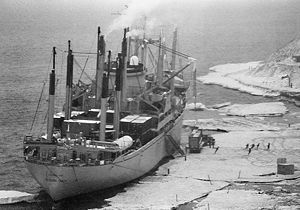 The fishing industry relies on open access to ports and harbor along the Antarctic Ocean coastline, which is unfortunately limited due to ice build up during the winter months. Access is further limited by government research stations, who limit commercial access to ports. Gille, Sarah T. February 15, 2002. (abstract), Warming of the Southern Ocean Since the 1950s in the Journal Science; vol. 295 (no. 5558), pp. 1275-1277. Retrieved January 8, 2008. Southern Ocean CIA, The World Factbook. The New Fifth Ocean from Geography.About.com. Geography and Map of Southern Ocean Geography.About.com. This page was last modified on 4 April 2016, at 14:08.